On the western shore of the Dead Sea, surrounded by desert wilderness, is the welcoming oasis of Ein Gedi – literally “spring of the kid or young goat”. The natural spring water and lush vegetation make Ein Gedi a popular destination for visitors today just as it has been for thousands of years. Evidence of human settlement in Ein Gedi dates back over 5000 years and in Joshua 15:62 it was named as one of the cities of the tribe of Judah. 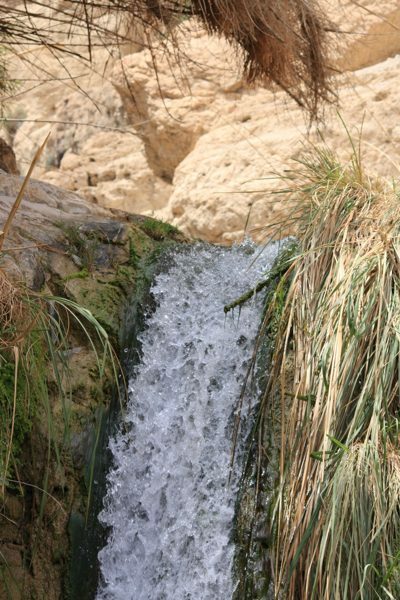 With plentiful sunshine and a continual fresh water supply, agriculture in Ein Gedi flourished. Ein Gedi became famous for its produce. In particular, its sweet dates and balsam for making fine perfume and ointments. Part of an inscription in the ancient synagogue is a warning to “whoever reveals the secret of the town..”. Some have suggested this refers to the ‘secret’ of making perfume from Persimmon for which Ein Gedi was renowned. The most notable mention En Gedi in the Bible is in 1 Samuel chapters 23 and 24. David and his men were being pursued by Saul and his armies and they sought refuge in the cliffs and caves of En Gedi. Saul eventually learned that David was in Ein Gedi. While David was hiding in one of the many caves Saul entered alone. David had the opportunity to kill Saul but recognizing Saul as the God-appointed king, David only cut the corner of his cloak. Ein Gedi has long been a refreshing stop for travellers in the rugged wilderness and it is the same today. Israelis and tourists hike the trails and cool off in the pools and waterfalls. Kibbutz Ein Gedi, founded in 1953, continues the agricultural tradition. It grows dates, mangoes and herbs and has an award winning botanical garden. The Kibbutz also bottles the natural spring water to sell throughout Israel.